MEMPHIS, Tenn. – Twenty-five-year-old David Bishop of Cordova was at home one morning last year when he decided to use an e-cigarette before going to work. He placed the device to his lips and pressed a button to start vaping. Suddenly, a lithium battery inside the device exploded, a lawsuit alleges. The blast blew pieces of the e-cigarette into the man’s face, breaking several teeth. And the blast ripped away a chunk of flesh, from his upper lip through his lower left cheek, the legal filing says. The explosion also splashed Bishop with battery acid, causing chemical or heat burns to his left hand, face, mouth and tongue, the suit alleges. The explosion that morning on May 31 was so violent that one piece of the vaping device flew into the air and left burn marks on the ceiling and wall before the piece finally landed on top of a cabinet, the lawsuit says. Bishop required 65 stitches in his face and missed weeks from his job as a warehouse maintenance worker, his legal team says. Bishop has filed suit against three companies involved in selling the e-cigarette and the two lithium batteries that powered it. The suit was originally filed in state court in October and transferred to federal court in February. Companies involved in the case have denied wrongdoing. A jury trial could take place next year. The situation illustrates the fire and explosion dangers that accompany the use of the increasingly popular e-cigarette devices. An e-cigarette or vape pen is a device that uses a battery to heat up a liquid that contains nicotine. The heat creates an inhalable vapor, and the practice is also called vaping. The devices were introduced to the U.S. market around 2007 and since 2014 have been the most popular tobacco product among U.S. youth, according to a surgeon general’s report. Unlike other devices that use potentially explosive lithium batteries, e-cigarettes are put in people’s mouths and held close to their faces. He declined to make his client available for an interview or to release photos of the damage to the client’s face and to the home, citing the ongoing litigation. Hill is also representing a client named Corry Stampley in another exploding e-cigarette lawsuit filed this year in Crittenden County Circuit Court in Arkansas. Lithium-ion batteries are used in a laptops, phones and a wide range of other devices and are relatively safe, Consumer Reports wrote in a 2016 article. However, in rare cases the batteries experience a failure called “thermal runway” in which the battery can hit temperatures as high as 1000 degrees. That can cause an explosion. The e-cigarette lawsuit quotes extensively from a 2017 report produced by the U.S. Fire Administration, part of the Federal Emergency Management agency. The report notes the intimacy of the e-cigarette devices — they go in people’s mouths — plus other differences that make battery explosions more dangerous than in other devices. A flat lithium battery in a device such as a cell phone case might catch fire, but is less likely to explode, the report says. And the shape and construction of e-cigarettes — something like a pipe — can contribute to explosions. “When the battery seal (at the end of the battery) ruptures, the pressure within the e-cigarette cylinder builds quickly until it ruptures, usually at the end,” the report says. Cylindrical lithium batteries in other devices, such as laptop computers, are usually contained in a rigid case that stops the failing battery from rocketing away, the report says. The report recommends against using lithium batteries in e-cigarettes. E-cigarette explosions are rare, but potentially deadly — at least two people have been killed in the U.S. The report notes that fires and explosions caused by batteries in electronic cigarettes are uncommon. A total of 195 separate incidents of explosion and fire involving an electronic cigarette were reported in the media between January 2009 and December 2016, the report says. Those reported incidents resulted in 133 injuries, of which 38 were severe. The report says many other small fires were likely not reported to any fire department. Since the 2017 U.S. Fire Administration report was published, media accounts have identified at least two deaths associated with exploding vaping devices. A 38-year-old man was killed in Florida in May 2018 when a vape pen blew two projectiles into his head and caused a fire that burned 80 percent of his body, the Tampa Bay Times reported. And a 24-year-old man died two days after a vape pen explosion in the Fort Worth area severed the carotid artery in his neck, The Washington Post reported. The device that exploded in the Cordova man’s face was a VGOD Pro Mech 2 vaping device that Bishop purchased at Create a Cig Cordova at 465 Germantown Parkway, the lawsuit says. The lawsuit demands damages from three companies: Create a Cig, VGOD, a California-based seller of e-cigarettes, as well as a U.S. affiliate of LG, the South Korean company that made the batteries. Darrell Suriff, CEO of the Create A Cig parent company in Austin, Texas, said he didn’t have specific information about the case. In a court filing, Create A Cig offered more than 30 legal defenses, including that the company didn’t manufacture the e-cigarette or the battery, and that Bishop’s claims are barred because he assumed the risk of using the device, and that the explosion is his own fault. VGOD made similar legal defenses, arguing that it didn’t manufacture the e-cigarette — it’s not clear who they say made it — and that Bishop brought the explosion on himself. “Plaintiff so carelessly and negligently conducted himself that he, by his own negligence, contributed directly and proximately to his own injuries,” the lawyers for VGOD wrote. Neither Create A Cig nor VGOD cited any specific actions by Bishop that brought on the explosion. Meanwhile, LG Electronics filed a legal motion asking the judge to dismiss the company from the lawsuit. “I can tell you they are probably barking up the wrong tree because LG Electronics doesn’t make any batteries,” said John Taylor, a company spokesman. He said a sister company, LG Chemical, may make batteries. Hill, the plaintiff’s lawyer, said the legal team is working to sort out remaining questions of what companies should be named in the lawsuit. Separately, the U.S. surgeon general’s office has launched a campaign urging young people not to use e-cigarettes, citing factors including a high risk of nicotine addiction, potential nicotine damage to developing brains, plus exposure to other potentially harmful chemicals in vapor. 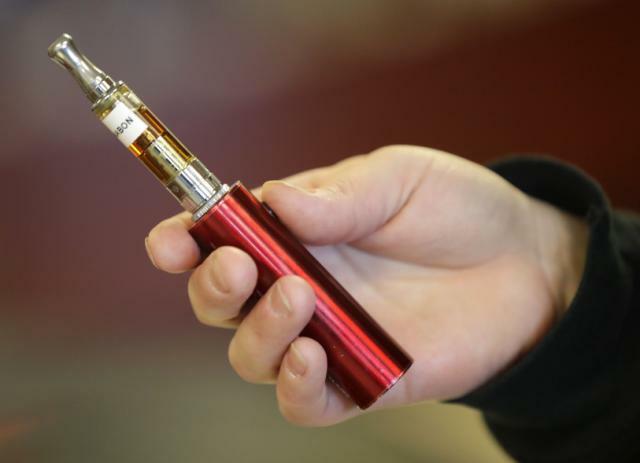 The federal Food and Drug Administration is also investigating whether use of e-cigarettes can cause seizures. A federal jury trial in the David Bishop case is set for June 15, 2020 before U.S. District Judge Sheryl H. Lipman. The parties have also agreed to mediation later this year, a settlement negotiation process that could make the trial unnecessary. Follow Daniel Connolly on Twitter at @danielconnolly.